Paris Street Playground is an approximately three-quarter acre park serving a densely developed residential neighborhood in East Boston; it is used extensively by residents and the Paris Street Community Center's after school and summer programs. We’re pleased to share that the park is featured in Berliner Seilfabrik’s 2019 Breathtaking Pla(y)ces brochure. This brochure focuses on custom Berliner play structures designed by landscape architects; Paris Street Playground, owned and maintained by the City of Boston Parks & Recreation Department, features a custom rope climber designed collaboratively by CBA and Berliner. CBA facilitated a robust, four-month-long / four public meeting public input process that included participants from the Community Center and neighbors to shape the final design. The renovation features a reoriented basketball court, stone dust sports area, tree-canopied lawn, climbing structures, swings, a splash pad, and play graphics. Our environmentally sensitive approach to the design is reflected in the pathway built on piers that traverses the grove of existing mature honey locust trees, solar-powered USB charging benches, LED site lighting, and a low-flow splash pad. The park’s “solar system” theme was chosen by the community during design development, and gives it a clear identity in the neighborhood. CBA principal Kaila Bachman will present “Stories from the Sandbox: Communication, Collaboration, and Management in Work & Play” on February 28th, 2019, as part of The University of Rhode Island 2018-2019 Landscape Architecture Lecture Series. She is a URI alumna (‘10) and will be presenting with Kristin Kaczmarek, ‘05. The lecture will begin at 7PM and will be held in the Richard E. Beaupre Center for Chemical & Forensic Sciences, Room 105A, 140 Flagg Road, Kingston, RI. All lectures are free / open to the public. On Thursday, February 21st, an exhibit titled In the Public Interest: Redefining the Architect’s Role and Responsibility featuring the placemaking process CBA faciliated for the new Derby Street Park in Salem, MA, will open at the BSA Space in Boston. The opening will be from 6-8PM and will feature a panel discussion. The exhibit will be up from 2/14 - 4/14. In the Public Interest: Redefining the Architect’s Role and Responsibility will showcase six innovative architectural practices reimagining the architect’s contribution toward the public good. The selected projects will offer unique perspectives on the value of a community-engaged design process and the expanding nature of practice while presenting new methods for the profession to design with Boston’s communities. On Monday, February 25th, from 6:00-7:30 PM at the BSA Space, Clara Batchelor, ASLA, LEED AP, Founding Principal at CBA Landscape Architects, will present Intimate Public Spaces in Greater Boston: Landscape Architecture as Placemaking. 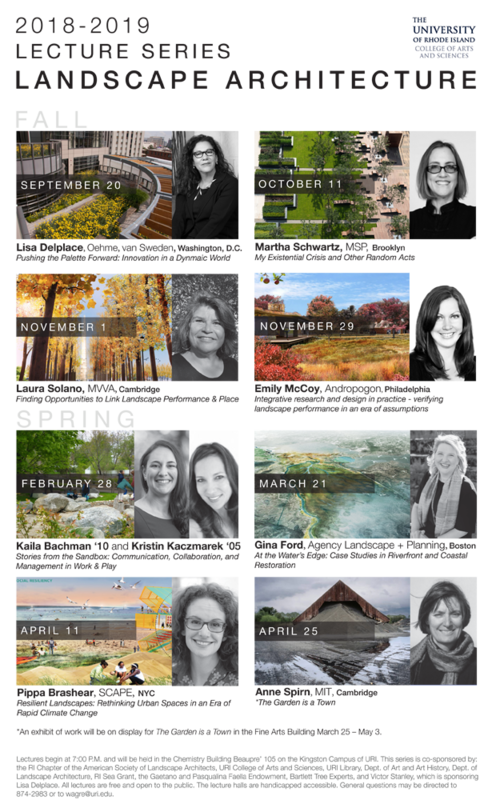 Clara will share the stories of select connective landscape designs serving adults and children in greater Boston. Particular attention will be paid to the narrative contexts and evolution of open spaces and parks, such as the Sidney Research Campus Public Plazas in Cambridge and the Paris Street Playground in East Boston. She will talk about the impetus for redesigning the Deanna Cremin Playground in Somerville and Cambridge’s Galaxy Park at the eastern terminus of Main Street in Kendall Square. Some of the issues to be discussed are: What’s special about the land use or evolution of the project? How did public / private partnerships evolve and impact the design? For public parks, how was the community brought into the design process? How have the projects been received? 2 CBA Designed Playgrounds - Paris Street Playground in East Boston and Hunt Almont Playground in Mattapan - were included in the Mommypoppins.com article titled "11 Innovative Boston Playgrounds Where Kids Learn as They Play"
CBA loves our playgrounds projects and we're honored to be included in another "best of" list for Boston! CBA is proud to announce that Deanna Cremin Playground in Somerville was awarded the 2018 Northeast Hardscape Award of Excellence in its category, Non-Residential Project Over $200,000! The judges' comments highlighted the project's overall creative approach, the permeable paving and sustainability focus, and the careful craftsmanship in design, detailing, and construction. Our thanks to the NECMA and the judging panel for the recognition, and to the rest of the project team, from the City and the contractor (NELM Corp) to the product reps we worked with, for a job well executed. Jessica Choi, Landscape Designer, attended the December 7th Unilock New England Annual Awards of Excellence event and received the Commercial Excellence in Design Award for CBA's Sidney Research Campus in Cambridge. This project was nominated for this award by Daniel Neviackas, the New England rep for Unilock Pavers. This public-private plaza features a 3 color linear paving design, as well as creative site features such as ping pong tables and custom wall mounted benches. CBA is very proud of how this project turned out.